The deLuxe Stitch System - a new type of "tension" that adjusts how much thread is used in the stitch to create perfect results! The Designer Majestic Hoop!!! It measures 14 1/4" x 13 3/4"! Smart Save - automatically saving your design and adjustments if your project is interrupted! 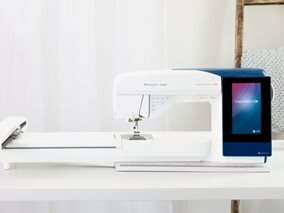 The JoyOS Advisor that provides on-screen tutorials, sewing projects, step-by-step instructions and sewing techniques. A private sewing instructor just for you!!! Large sewing area - 10" from the needle to the body of the machine; enlarging your projects and hoops! The Designer Brilliance 80 has so much to offer that it was hard to stop at 5 favorite features! Come in for a demonstration today--Sew a new story!